Soccer is the most popular sport in the world and the FIFA World Cup TM the pinnacle every four years of the game. The spectacle provides an advertising executive dream with world-wide coverage of the games as well as spotlighting the greatest athletes in the game. 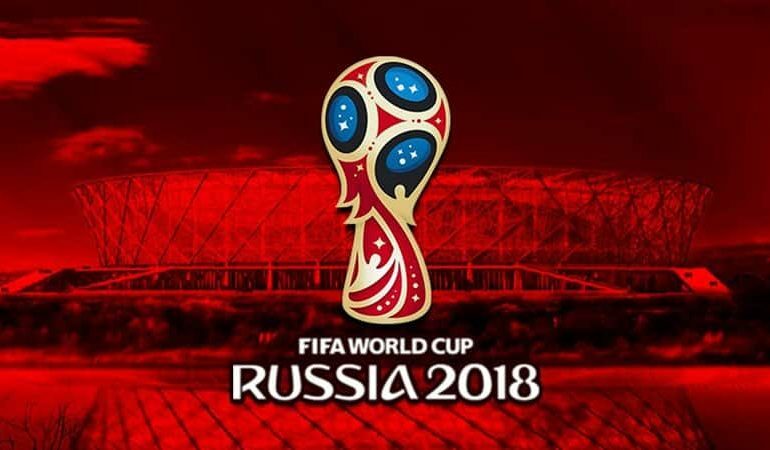 The main advantage to advertisers is they can keep their names and logos in front of world-wide audiences for long periods, over the length of the tournament and beyond. This is known as ‘embedding advertising.’ The FIFA World Cup TM affords sponsors global exposure on a grand scale. By far the company most associated with the competition is adidas. Rudolf and Adolf Dassler founded “Gebrüder Dassler Schuhfabrik“ (Dassler Brothers Shoe Factory) in Herzogenaurach, Germany and they became well known for making quality sport shoes. The two brothers fell out in 1948, and Adolf Dassler renamed the company Adidas after his own nickname (Adi Dassler). Rudolf Dassler meantime, started his own company PUMA Schuhfabrik Rudolf Dassler. 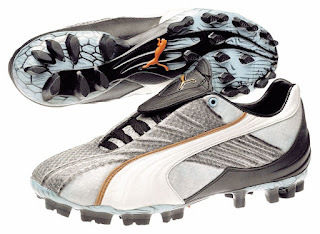 Puma has continued to rival adidas in soccer boot manufacture and supply. It was estimated adidas will pay $70 million every four years to FIFA to maintain advertising and merchandising rights to the biggest international soccer tournament on the planet. 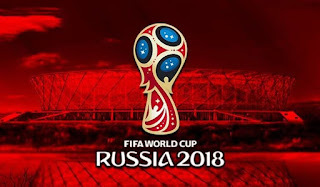 This exclusive contract prevents Nike and other apparel competitors from selling official World Cup memorabilia nor can the term FIFA World Cup TM be used in their advertisements. adidas reportedly pays German soccer’s governing body $37 million each year to keep its name on German soccer uniforms. Puma renewed their contract with the Italian National team in 2012 through to 2018 and will net the Italian soccer body $27.5 million annually. Between adidas and Nike they account for 70 percent of the soccer equipment market, including shoes, jerseys , gloves and soccer ball sales. Yet according to Bloomberg Businessweek, in 2010, Nike had 17 percent of the global sports apparel market, compared to Adidas’s 12 percent. In 2008, Nike signed Brazil to a sponsorship contract which extends until 2018, at a valued at $34 million per year, according to SportsPro Media. Sponsors have a vested interest in both team and individual player success. The more games a team plays in, the more exposure its sponsor gets. Playing in the Cup final gives is estimated to give nearly five times the exposure of the average Cup game. The more goals a player scores in a certain jersey or with a particular line of shoes, the more likely apparel suppliers are to generate sales. many studies have shown, sponsorship and endorsements pay off as aspiring players look up to international players and buy into the image (or brand) that the star player is playing with. Marquee players as exemplary illiuminaries of the sport like David Beckham. Cristiano Ronaldo and Lionel Messi receive millions in sponsorships. During his playing career David Beckham received an estimated $11.7 million annually for shoe endorsements alone. 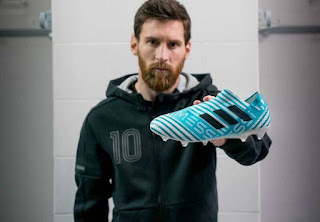 Argentina’s Lionel Messi is reportedly paid $3.3 million each year to wear adidas shoes and Nike pays Portugal’s Cristiano Ronaldo a reported $8.4 million annually to wear their colorful cleats. PUMA quickly launched their first football boot, the “ATOM” . Immediately post-war, West Germany were banned from participating in the FIFA World Cup, but were encouraged to participate in international football . The first game post war game was against Switzerland in 1950. 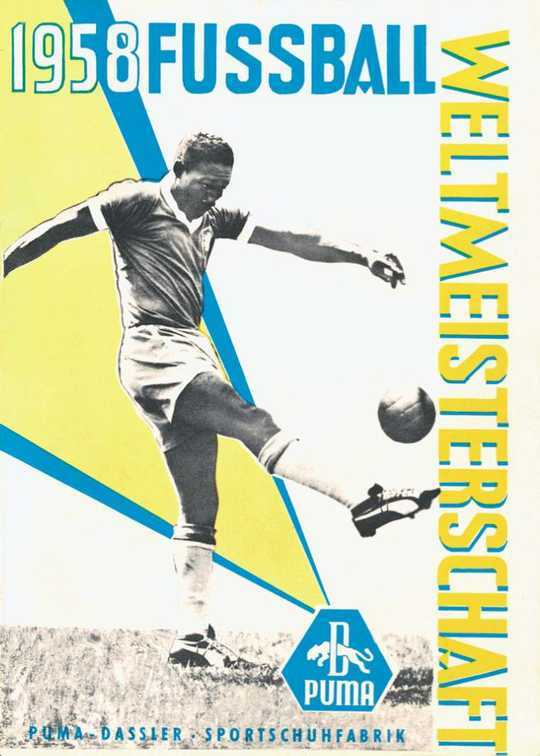 Several of the West Germany national team wore PUMA boots including Herbert Burdenski, who scored the goal. In 1954, adidas supplied the winning team of the FIFA World Cup Switzerland 1954 with adidas boots. Founder, Adi Dassler, designed his boots with screw-in studs, which could be adapted to the weather. 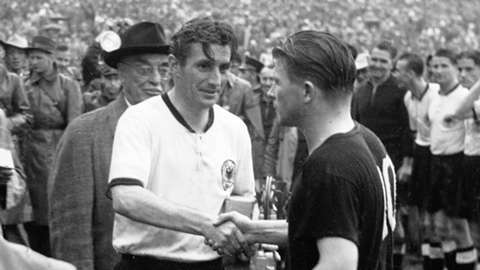 Captain, Fritz Walter wore the shoes both prior to and during the 1954 world cup in Switzerland. The adidas Argentinia was lightweight and flexible, and provided good contact with the ball and secure contact with the pitch. Made to a narrower last it had a lower-cut upper and the traditional hard toe cap was dispensed with. The key to the new boots was the outsole was flexible and the boot featured easily changeable thread inserts, which were pressed through the insole and outsole from the inside (1952 patent), along with slim 18 mm nylon screw-in studs. The Germans reached the final but were huge underdogs, and faced a Hungarian team which had previously defeated them 8-3 earlier in the tournament. On the day of the game it poured with rain, turning the pitch into a bog. 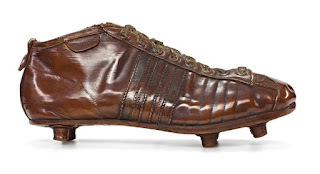 The Germans fitted longer studs into their adidas Argentinia boots whilst the Hungarians, who were forced to wear their much heavier wet-weather boots. Sure footed the Germans pulled off a shock result, winning 3-2, in a game still known as “The Miracle of Bern,” after, Helmut Rahn scored the decisive goal wearing adidas boots. 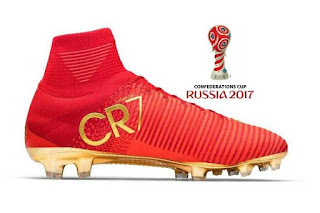 The teams' boots were resoled after the World Cup. The marketing potential of this feat (excuse the terrible pun! ), was not lost on the company’s executives. At the next FIFA World Cup TM , French striker Just Fontaine was wearing adidas Weltmeister boots when he scored 13 goals in the tournament to make him the top goal scorer of the competition. The Weltmeister (World Beater) had the first nylon soleplate, something that still appears on most boots to this day. The PUMA “SUPER ATOM” was launched in 1952 and had screw-in studs which predated his brother’s version. The PUMA “SUPER ATOM” with an enhanced version “BRASIL” followed. 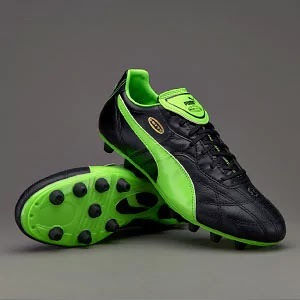 In 1958, PUMA introduced their trademark logo, and in the same year, PUMA football boots are the only German-made football boots in the final of the World Cup in Sweden. PUMA celebrated the victory of the Brazilian team with an advertising campaign. By 1962, the adidas Chile 62 had the look of a modern soccer slipper and was worn by numerous players, including Karl Heinz Schnellinger. in the 1962 FIFA World Cup TM Chile. After Uwe Seeler (West Germany) sustained an achilles tear in 1963, adidas devised a boot with a cushioned layer at the heel to take the pressure off the tendon. Adi Dassler designed a special orthopedic soccer boot which enabled the athlete to play again as early as august of the same year. The adidas Achilles had black uppers and lining made of black, specially tanned cow hide. the heel seat insert was made of kangaroo leather. the pads are made of 10 mm foam. The boot had added protection at the rear to take pressure from the insertion of the Achilles tendon. The boot was worn half a size up and the studs and the washers are made of aluminium. 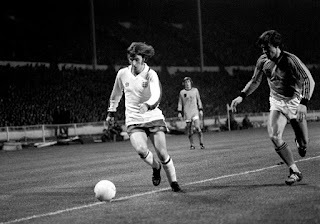 The injury would normally end the career of a professional player but Seeler was exceptional and persevered to return to the national side and wore the boots at both the 1966 and 1970 World Cups. Adidas’s success at customising soccer boots led to a surge of new designs in footwear, all aimed at reducing weight and increasing movability. The high-ankle boot was swiftly replaced by a lower cut and technological advances in leather made more durable boots possible. adidas remained the market leader, but other manufacturers were in on the act, with Hummel, Mitre and PUMA all vying for supremacy. 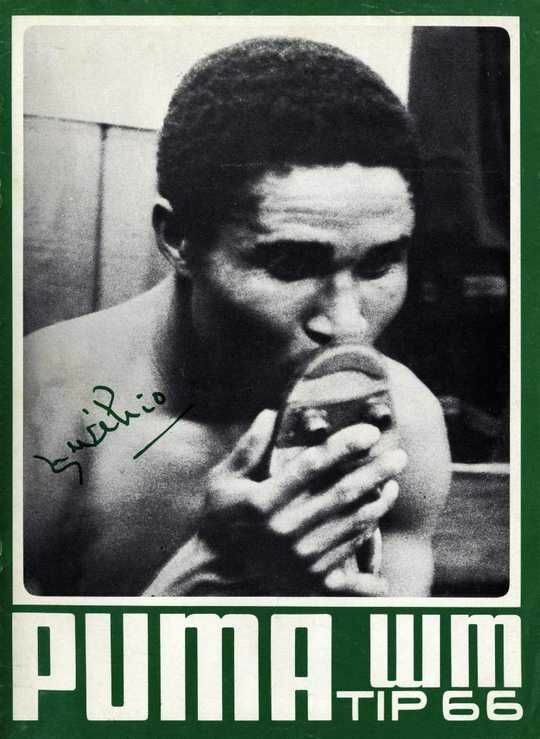 In 1962, Pele was endorsing PUMA boots and four years later at the 1966 FIFA World Cup TM, 75% of players were wearing adidas boots. In 1963 adidas started to produce soccer balls and by 1970 they had become the official sponsor of the FIFA World Cup with the first ever official ball for the competition e.g. The Telstar. 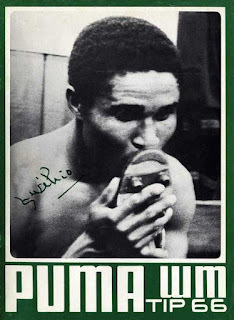 At the FIFA World Cup TM England 1966 Puma supplied Puma Kings soccer shoes to Golden Boot winner Eusabio (Portugal). The boots were later released for general sale with full endorsement from Eusabio. Meantime, the West German Captain, Franz Beckenbauer was seen wearing the adidas Cosmos. 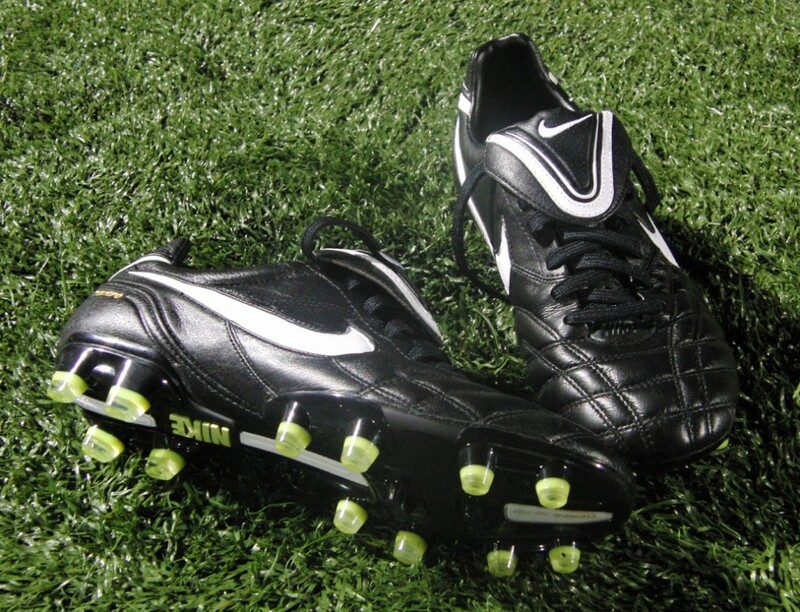 The new boots featured thinner studs created using a mould & high-pressure injection method. The same methods are still used in today’s production of football boots. 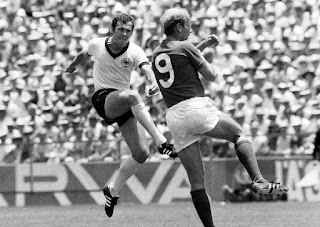 Professional football players are often superstitious people and Beckenbauer (aka The Kaiser) was no exception. He preferred to wear the same boots until they were completely worn out, which hampered his sponsors from introding new models of his boots. His nemesis and English Team Captain Bobby Moore, wore adidas Diamant football boots. His bespoke boots were modelled on the “Diamant” and produced on a special last which was created to replicate Bobby Moore’s foot. The upper leather and lining were made of black, specially tanned cow hide (water-repellent) and the insole is made of vegetable-tanned bottom leather (vache leather). the pre-fabricated outsole was made of blue polyamide (nylon). the studs and the washers were made of leather, nylon and aluminium. Moore himself, was responsible for the unconventional choice of studs and wore his boots when he picked up the trophy. By the next FIFA World Cup TM in 1970. adidas and Puma, both realised the marketing value of player endorsements but at the same time with a limited number of marquee players and an ever increasing budget required to lure them and to avoid a bidding war , it was decided to reach a "peace pact". 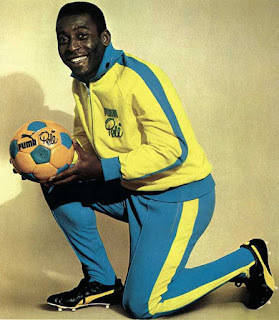 Pele, was the greatest football player in the world at the time, and both companies agreed not to sign a deal with him. This was called the "Pele Pact." All fair and good but Pele, not wishing to be undervalued worked a deal with the Puma representative, initially unbeknown to the company. He offered Pele $25,000 for the 1970 World Cup and $100,000 for the next four years (plus a cut of the sales of Pele brand sneakers). When Puma discovered an offer had been made and accepted they agreed. As part of the agreement the player was asked to make a deliberate gesture during a match to tie his laces so the cameras could pan down to him wearing Puma boots. During the Brazil v Peru game at the FIFA world Cup Mexico 1970 Pelé stopped the referee with a last-second request to tie his shoelaces before kneeling down to give millions of television viewers a close-up of his Pumas. In the tournament final between Brazil and Italy, Brazil then went on to beat the Italians 4-1, with Pelé scoring the opening goal wearing PUMA boots. Within a week, the action of the player brought 300% increase in sales of the shoes. In 1971, Blue Ribbon Sports (BRS) decided to launch its own brand of football boot, which was called The Nike. It had a moulded rubber outsole with nine cleats at the forefoot and four at the heel which were ideal for control, traction and stability. The new boot was made in Mexico but sadly the first ‘Swoosh’ football boot proved unpopular. Despite the setback, the Nike, was an enormous break the brand’s running shoe roots, and a major aesthetic and technical stepping stone for Bill Bowerman and Phil Knight’s nascent brand. 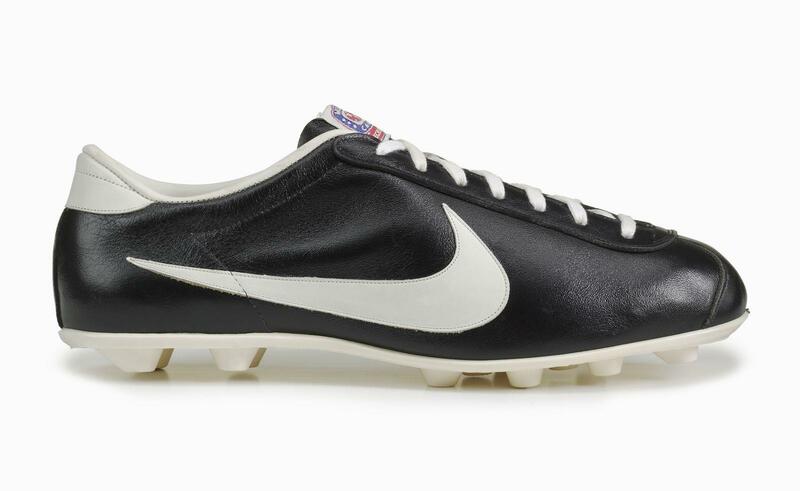 Nike’s next multi-purpose moulded cleat came in 1972 with the Nike Turf Quick. The shoe was designed for both soccer and football (gridiron). A new complication arose with player endorsement in 1974 when the Netherland National team wore adidas orange jerseys but the captain, Johan Cruyff was signed to PUMA and refused to play in the 1974 World Cup TM final between Holland and West Germany wearing an adidas shirt. 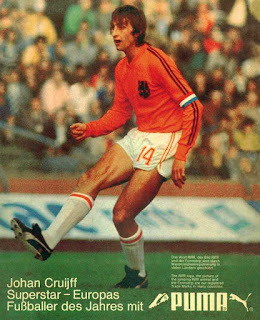 The compromise was Cruyff had his three-stripe shirt and shorts redone, so that it sported only two. Stan Bowles (England) played played against the Netherlandsin 1974 wearing an Adidas boot on one foot and a Gola boot on the other and took sponsorship payments from both firms. 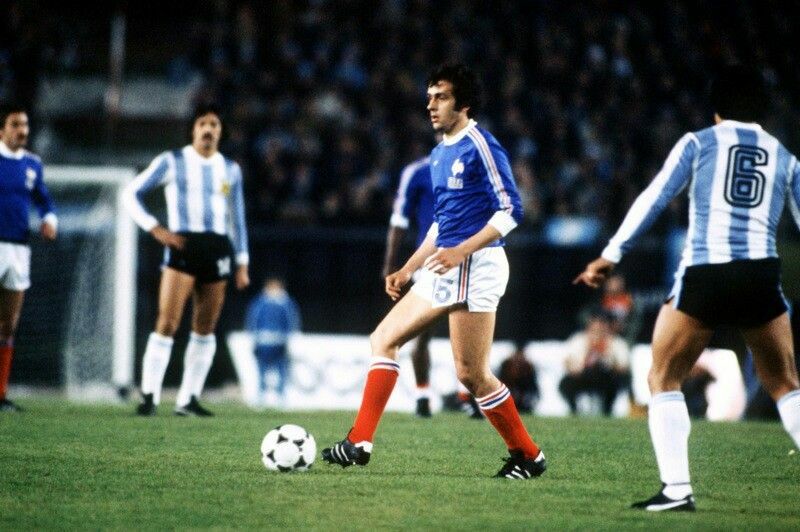 Following several complaints from players at the 1978 FIFA World Cup TM Argentina, including Karl-Heinz Rummenigge and Michel Platini their studs were too hard for the firm pitches in Argentina, adidas promised their new boot would be ready for Spain, where conditions were similar. Keen to see off any would be rival adidas introduced the adidas Mundial Team (Copa Mundial) TM in 1979. These were specifically designed for the FIFA World Cup Spain 1982 and soon after became the world's best-selling soccer shoe and continues to be an evergreen, today. For the first time the boot carried "an approved by FIFA " label on sole. adidas Copa Mundial were made from kangaroo leather, with extra leather supports around the heel, the vamp pad was made of 3 mm foam, covered with self-adhesive nylon fabric, and the tongue lining made of foam/charmeuse leather. The upper incorporated a stiff heel counter and a comfortably cushioned vamp. The boots were made in narrow fittings and the sole unit has a double density (bi-density) construction. The polyurethane outsole was flexible and highly resistant to wear and tear. The black moulded studs were made of polyurethane which made them robust and extremely durable and the shorter, 12-stud design was ideal for the hard Spanish pitches of the 1982 World Cup. The new adidas Copa Mundial boot were worn by several of the Belgium side that beat defending champions, Argentina (i-0) in the Camp Nou. Two of the world’s biggest stars, Diego Maradona of defending title holders Argentina and Franz Beckenbauer of eventual runners-up West Germany, wore the shoes to great effect. 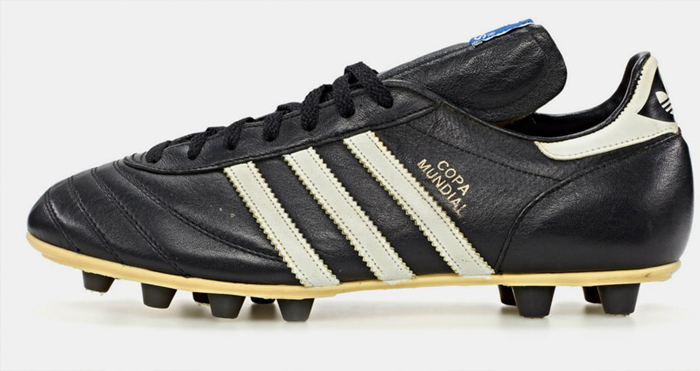 The adidas Copa Mundial became the most successful football boot produced by adidas and remains the highest-selling boot of all time. 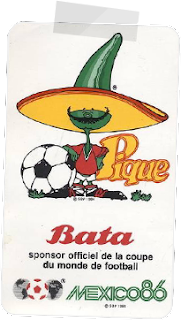 The 1982 FIFA World Cup TM was the first to have an organized corporate sponsorship program. At the time, there were nine first-tier sponsors which raised $19 million. The Bata Shoe Company sponsored the 1986 FIFA World Cup TM but adidas became a major sponsor in 1998 and have remained there ever since. There are now 15 first tier sponsors. 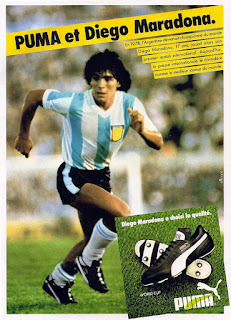 During the FIFA World Cup 1986, Argentina’s supremo captain, Diego Maradona wore special edition Puma Kings. 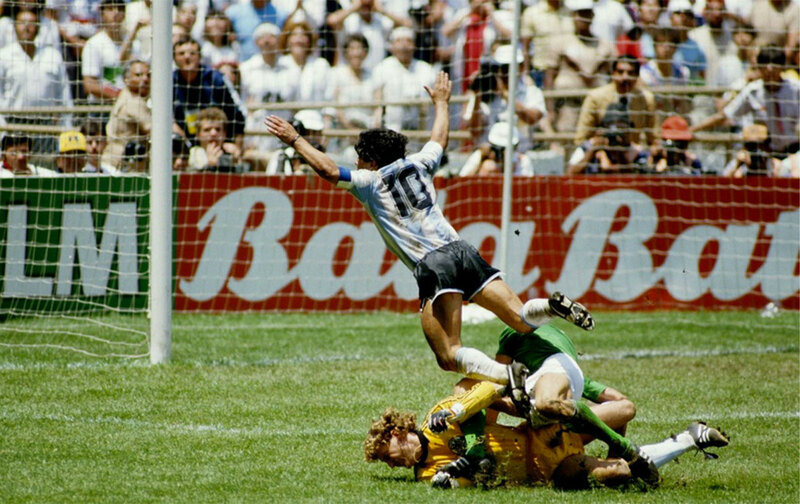 He had them on his feet when playing England in the quarter finals, Maradona scored both the Hand of God goal; and his spectacular gasp-inducing meandering run up to the greatest goal ever scored. Argentina went on to a second World Cup title in the span of eight years. Being in the right place at the right time, certainly counts especially if you are a sponsor of the world game. 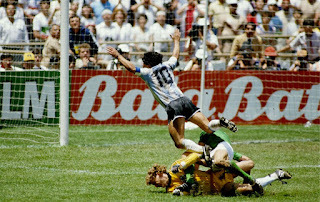 The pictures of Diego Maradona goals also captured the Bata billboards which were seen worldwide. At the 1990 FIFA World Cup TM Ruud Gullit (the Netherlands) was sponsored to wear a black and white football boot made by Italian sports brand Lotto. Nike were now keen to muscle in on the 1994 FIFA World Cup TM in the United States and released their Nike Tiempo Premier boots . They intended to break the dominance of Hummel, Puma, and Adidas, who up until then, were the favoured brands for international soccer players. 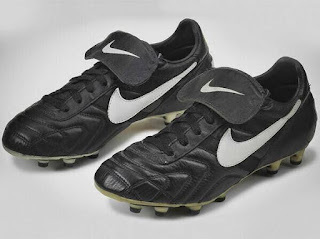 Sponsorship agreements were reached with Brazilian Romário and Italian Paolo Maldini for the use of Nike Tiempo boots. 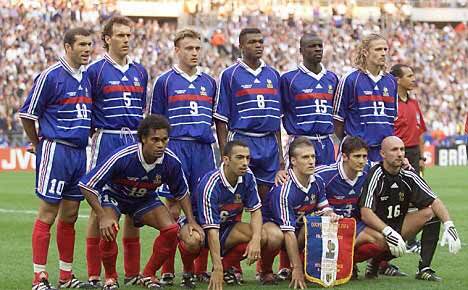 Nike also supplied boots to ten of the players in the final, between France and Brazil. Later that year, the first Nike cleats became commercially available to the public and have became an evergreen thereafter . The Nike Tiempo football boot is known for its comfort and is available in different colours with four different soles: FG (firm ground), SG (soft ground), AG (artificial grass) and IC (indoor). adidas also introduced the adidas Predator TM in 1994. This boot was the brainchild of Australian, Craig Johnson (formerly Liverpool FC) and is considered by many to be a significant development of the soccer boot allowing players more control, swerve and power on their shot. 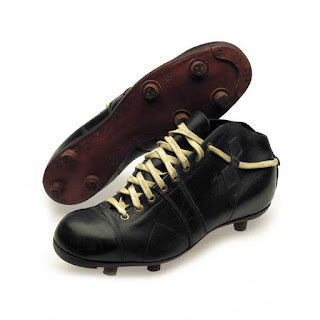 Traditional football boots had given minimal exposure or ‘sweet spot’ with which to hit the ball straight. Even with hours and hours of practice Craig’s technique never really improved satisfactorily. So, he experimented but roughening the upper of the boot and using alternatives to leather. At first, he replaced part of the leather upper with rubber (initially ripped from a ping-pong bat), which greatly aided control of the ball. He admits much of his inspiration came whilst windsurfing, wearing rubber shoes. He tracked down the manufacturers and together they designed a football boot mould. Then Craig designed a series of protruding jets and fins which greatly improved the boot's precision. Meanwhile he kept searching for the perfect type of rubber. His breakthrough came whilst playing with a child's ball. Craig spent a considerable amount of his own money in developing the prototypes and met with considerable resistance from boot manufacturers. His prototype boot was rejected by the major companies until Johnston eventually persuaded Franz Beckenbauer, Karl-Heinz Rummenigge and Paul Breitner, former adidas athletes and German legends, to be filmed using the boots in snowy conditions, to demonstrate their improved grip. 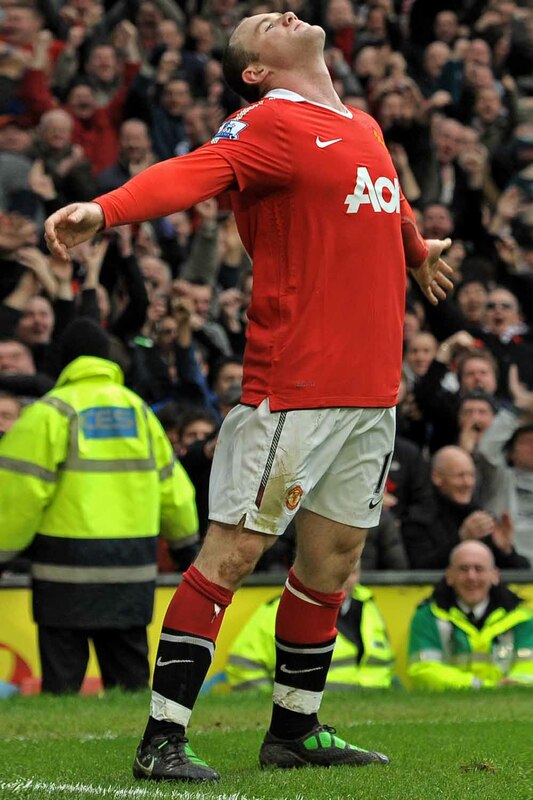 adidas were convinced, and bought the rights to the boot, which went on to sell millions of pairs. 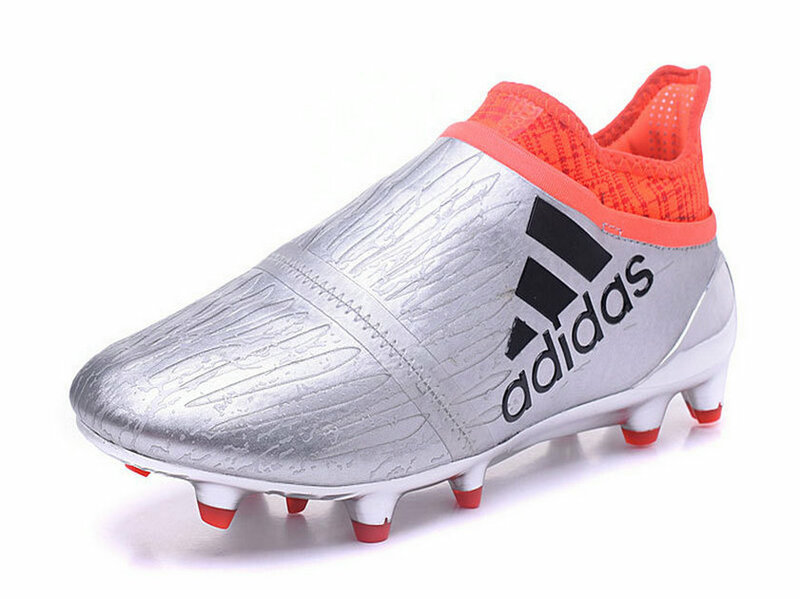 It marked a notable change from traditional boots as it saw rubber fins to aid touch, control & spin attached to the upper of the boot. The ’90s, saw an explosion of new colours and materials available with many players encouraged to express their indiviualism with boot designs. David Beckham was probably the highest profile player to spearhead movement and each new boot was captured to maximum marketing effect. Researchers also determined high colourway fashion encouraged improved peripheral vision, with increased passes to the key players feet. Although seasoned veterans cautioned colourful boots might also attract hard tackles. In any event high colourways became the new black. 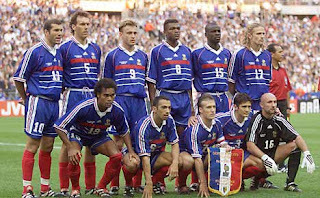 At the FIFA World Cup TM France 1998 adidas paid $40 million US to sponsor the competition both finalists France and Brazil wore adidas apparel. 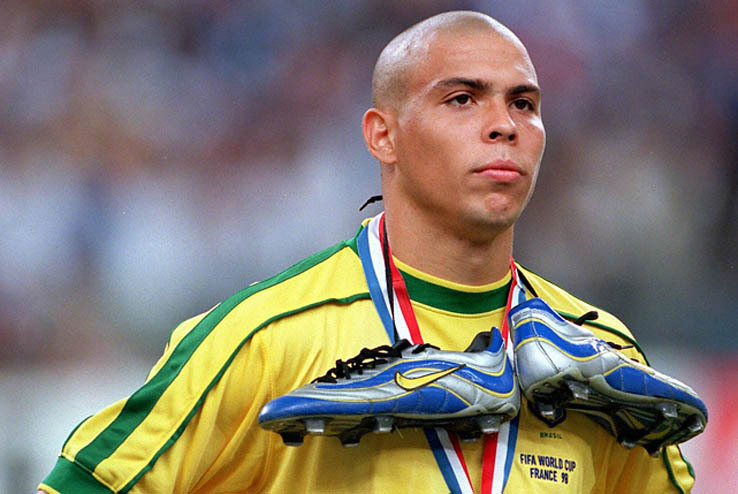 In 1996, Nike signed Ronaldo "O Fenômeno" (The Phenomenon) to a 10-year contract and to a lifetime endorsement deal worth over $180 million. He wore the new Nike Mercurial Vapor (R9) and the silver/yellow/blue boots tipped the scales at only 200g. Colour and weight were the new vogue in modern soccer slippers. Behind the scenes at the final of the tournament Ronaldo suffered a seizure in his hotel room hours before the game. When Mario Zagallo (head coach) submitted a team sheet without Ronaldo allegedly Nike insisted he played, and a new play list was issued 20 minutes before the match which included Ronaldo. The Brazilians lost the final 3 – 0 and their star player’s performance was below par. After the tournament the Brazilian government launched an official inquiry to investigate the relationship between Nike and the Brazilian Football Federation (CBF). The allegations were that Nike, having signed a $175 million endorsement deal with the CBF, had insisted that an unfit Ronaldo play. Nike denied any impropriety or undue pressure to field Ronaldo in the finals. At the 2002 FIFA World Cup TM Korea/Japan, Ronaldo now back to full fitness, wore the new Nike Mercurial Vapor when he scored the two goals to secure victory for Brazil in the final over Germany . In the run-up to the 2002 World Cup in Korea and Japan, Ronaldo starred in a "Secret Tournament" commercial (branded "Scopion KO") directed by Terry Gilliam, appearing alongside football players such as Thierry Henry, Fabio Cannavaro, Francesco Totti, Ronaldinho, Luís Figo and Hidetoshi Nakata, with former player Eric Cantona as the tournament "referee." 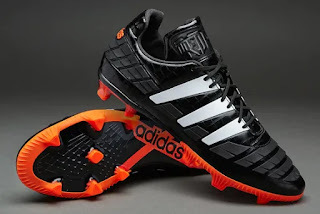 "
By far the most popular boot worn at the tournament was The Adidas Predator TM . Now with a cleat configuration to give an extended base to the foot, this is thought to reduce harmful rotational forces from passing up to the knee. The stud patterns also optimised ground traction allowing for an efficient take off in accelerated movements. The highest profiled player wearing customised Adidas Predators TM was David Beckham (England). PUMA sponsored 12 out of 32 teams, to become the biggest team supplier at the FIFA World Cup Germany 2006. NIKE sponsor eight teams and adidas sponsored six national teams. The other sponsors of national teams were Lotto (Ukraine and Serbia and Montenegro), Joma (Costa Rica), Umbro (England and Sweden) and Marathon (Ecuador). 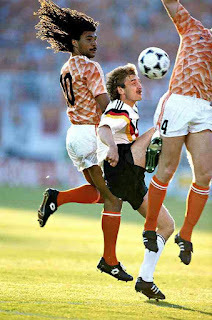 Not all players were kitted out head to toe with the same sponsor, unlike West Germany in adidas. The official kit sponsor insisted players wear their footwear and strips. Many players had separate boot conracts but were prevented from wearing them due to contractual agreements with the National Team . PUMA pulled a real coop by sponsoring Italy at the tournament and they went on to win the World Cup 2006 after beating France in a penalty shoot out. The German Company also came to the forefront of speed boot design when they released their 190g, Speed Boot V1.06 which was the world’s lightest football boot at the time. The close fitting boot was confortable and the carbon fibre plate helped to keep the weight down. Asics custom design boots for goal keepers and the Janus JP Series was released in 2006. The signature model was used by Yoshikatsu Kawaguchi in the FIFA World Cup TM Germany 2006. 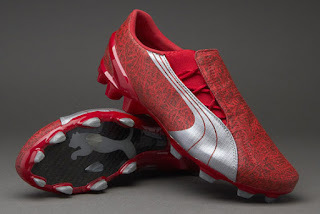 In the FIFA World Cup TM 2010, South Africa, Nike sponsored 10 teams : adidas 9 and Puma 7. A handful of smaller suppliers, including Lotto, Marathon, Joma, Uhlsport and Burrda Sport, claimed one international soccer contract, rounding out the 32 teams in World Cup contention. Nike released their first Elite version of the Nike Tiempo Legend III in Metallic Mach/Purple/Total Orange then later the Tiempo was released under the 10R (Ronaldinho) and Ronaldinho had his own version called Ronaldinho Dois. The Nike Mercurial Vapor Superfly II had pressure sensitive retractable studs and Cristiano Ronaldo assisted in the design of the Nike Mercurial Vapor Superfly. Meantime Wayne Rooney wore Nike T90 Laser III at the 2010 FIFA World Cup TM. Adidas introduced the F50 as their speed boot. It was construced from synthetic materials with the aim of making the boot as light as possible. Leo Messi brought the public’s attention to his new adidas +F50i, when he was photographed kissing them at the 2009 Champions League Final. The +F50i was the last of the F50s to offer complete customization. Although never quite matching the achievements & popularity of the Predator, the F50 found a solid fanbase and continued to be updated until 2015. PUMA sponsored Ghana, Cameroon, Ivory Coast, Algeria, Italy, Switzerland and Uruguay and futher to commemorate the 50th birthday of Diego Maradona, PUMA released the Puma King Diego Finale.